If one or two players become unavailable for an upcoming fixture then rather than changing several team sheets individually you can quickly shuffle players between team sheets on a single web page using drag and drop. You can also use the same web page to make changes across multiple fixtures. To use the Multi Fixture & Team Sheet Editor login to your SOCS control panel and click through to your Sports Programme from the main menu. 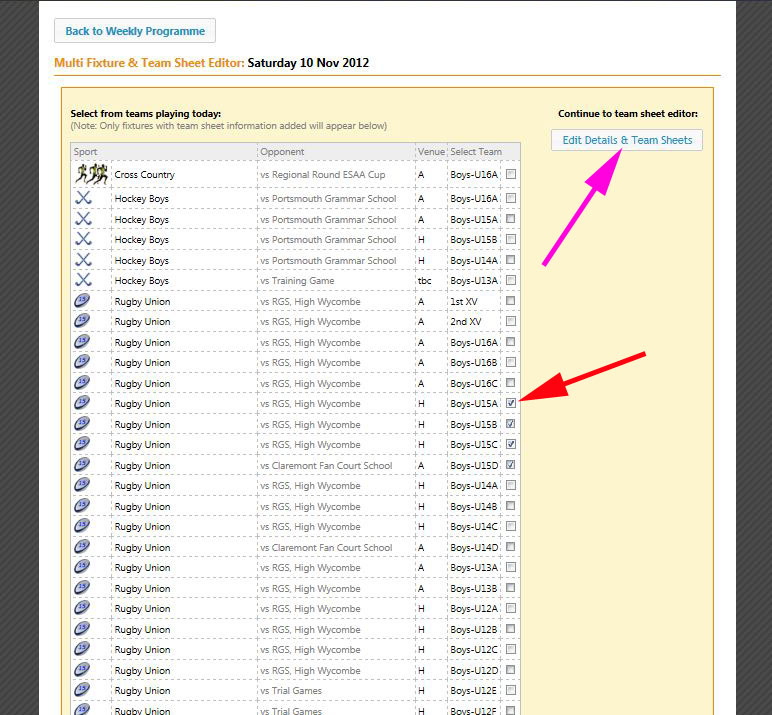 Multi Fixture & Team Sheet Editor buttons are available for all of the upcoming fixtures in the sports programme (not fixtures in the past) and they appear adjacent to each day as shown in Figure 1 below. Figure 1 – Multi Fixture & Team Sheet Editor buttons. 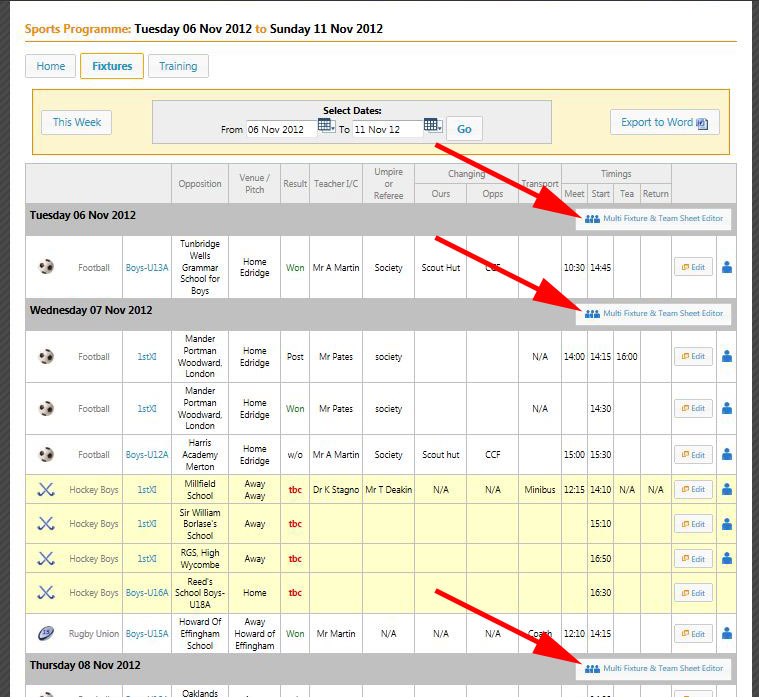 Click a Multi Fixture & Team Sheet Editor button for the required day/date. These buttons are indicated by the red arrows in Figure 1 above. Select the teams you want to edit. The U15A, B, C and Ds have been selected as indicated by the red arrow in the example in Figure 2 below. Click the Edit Details & Team Sheets button indicated by the purple arrow in Figure 2 below. Figure 2 - Select the teams and fixtures you want to edit. Drag and Drop Players. In the Multi Fixture & Team Sheet Editor screen, indicated by (1) in Figure 3, you can drag and drop players between team sheets to quickly alter and finalise team selections. If, for instance, one player becomes unavailable you can shuffle the players around to rapidly adjust your team sheets to resolve selection issues without needing to visit several team sheets to edit each individually as before. Adding New Players. New players can be added to a team sheet by clicking through to the respective +Add New Players button indicated by (2) in Figure 3 and then selecting players from the year group pop-up window. Alerts appear for any player selected for another team on the same day. 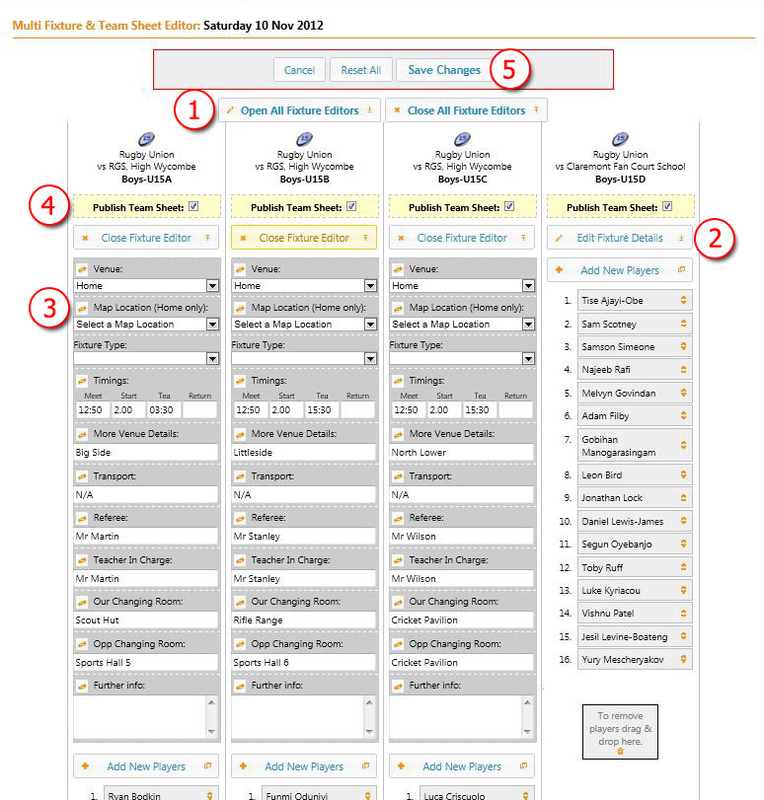 Figure 3 - The Multi Team Sheet & Fixture Editor web page. Open and Edit Fixtures Details. You can open the fixture details for every fixture by clicking the Open All Fixture Editors button, indicated by (1) in Figure 4, or you can open and edit any individual fixture using the respective Edit Fixture Details button, indicated by (2) in Figure 4. Applying Changes to Multiple Fixtures. By using the “Apply to all” buttons for any open fixture you can apply an existing value or any change you make quickly across all the other open fixtures. An “Apply to all” button for the “Map” setting is indicated by (3) in Figure 4 below. “Apply to all” buttons are located in the same place for the other fixture details such as venue, timings, transport etc. Saving and Publishing. 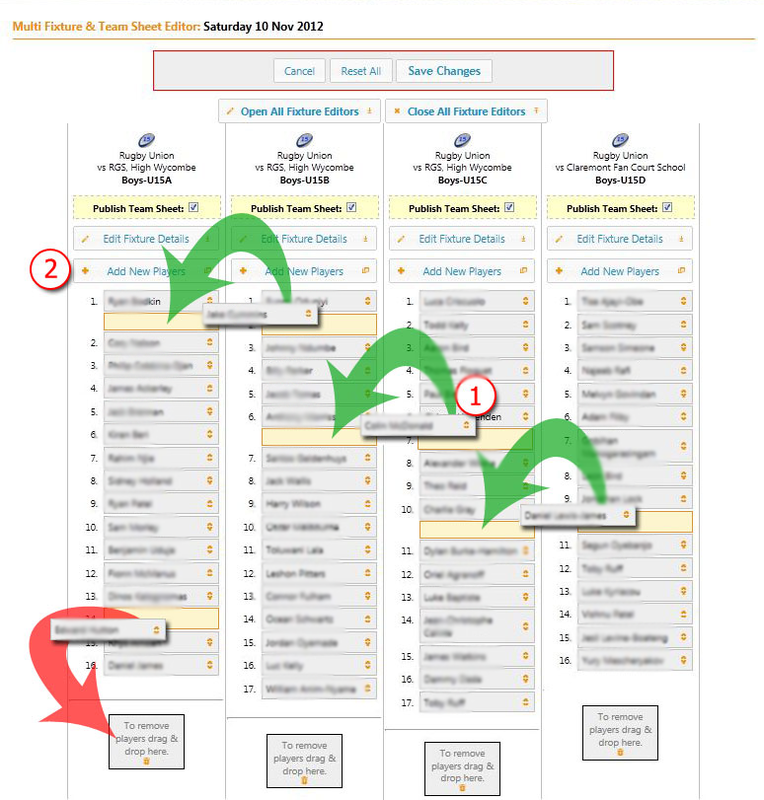 To publish all or a selection of team sheets you should ensure the respective Publish Team Sheet check boxes are ticked (as indicated by (4) in Figure 4) before saving. To save the changes without publishing the team sheets to your sports website ensure to un-tick the Publish Team Sheet check boxes and then click the Save Changes button indicated by (5) in Figure 4. Figure 4 - Applying changes to multiple fixtures. Important Note: The above capability is for editing only and not for creating new blocks of fixtures or team sheets. Block fixtures and team sheets should be created in the usual way.